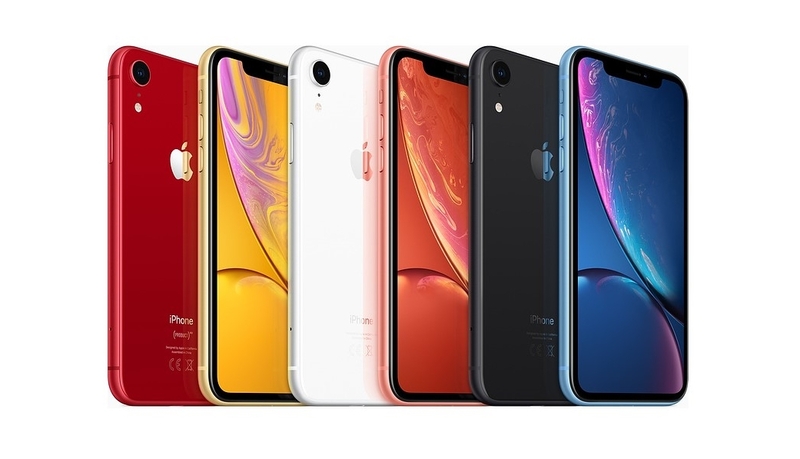 Apple iPhone XR offers many options. There has been much excitement since Apple’s iPhone XS and the iPhone XS Max became available. It would appear that Apple has taken a lot of the things that make these two phones special and packed them into the body of the iPhone XR. At Dialogic Telecom we have been busy discussing the benefits of each handset with our customers. Although, still not cheap, the good news is that the iPhone XR is less expensive than either of the other two phones. According to PC News, Sept 2018, 33% of people say the most important factor they consider when buying a smartphone is price. The iPhone XR would appear to be the answer to this but let’s compare some of its features and then you can decide. The iPhone XS and XS Max have a stainless-steel body, whereas the XR uses aluminium. While some may view this as a negative thing, others suggest that it’s positive because it won’t show scratches as easily as stainless steel and it comes in a much wider range of bright colour options. All three models have the same internal components, and like the original iPhone X, there is no home button. The XR is less water resistant than its pricier variants, which may be something to consider if you are prone to dropping your phone in a swimming pool or lake rather than just the toilet or bath. 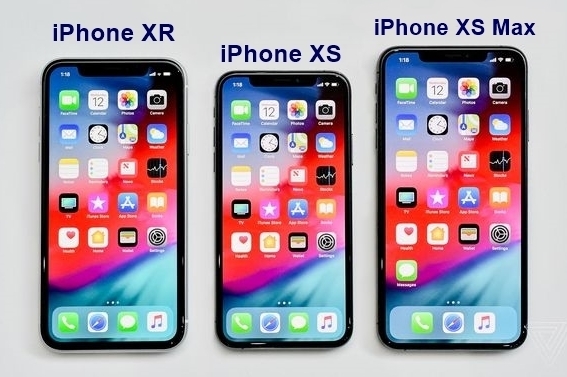 Regarding size, the XS may feel a little small for some people while the XS Max may be quite a handful. Therefore, the iPhone XR appears to strike an excellent balance sitting between the other two, in this regard. The XR has a less sharp LCD screen compared to the cutting-edge OLED screen on the XS and XS Max. This means the colours and contrast will not be as strong or colour-accurate. The dimmer screen could be a deal breaker for some of you. However, as Apple has been delivering great LCD screens for years, for others it won’t be a major issue as it still looks very good. Aside from the display, the other main difference between the phones is the rear camera. While all three models have the same 12-megapixel, f/1.8 rear camera the XS and XS Max have dual-lens while the iPhone XR has only a single lens. This means that although the XR has optical image stabilisation like the other two, it lacks the optical zoom and telephoto lens capability. However, all three phones have the same front facing true depth camera allowing for Face ID and Portrait mode as well as animated selfies. 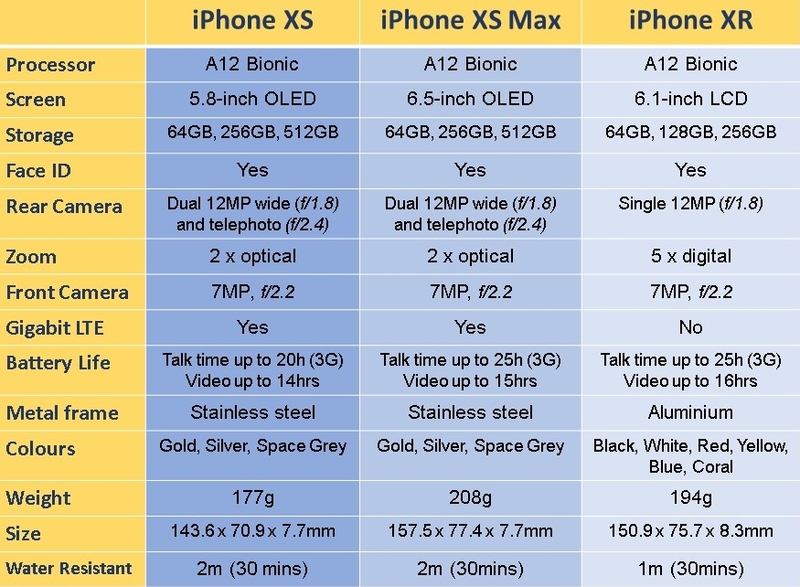 The iPhone XR uses the same A12 Bionic Chipset as the iPhone XS and XS Max. This is Apple’s latest processor, a 7nm chip that, according to the company, represents a breakthrough in computational power. All three also use IOS 12 so there’s minimal difference when it comes to software. On testing, it has been noted that there is significantly improved battery life in the XR compared to the other two models, which is surprising given the cost. Apple says that the iPhone XR has the longest lasting battery currently available. All three models are capable of supporting two phone lines by including eSIM and one physical nanoSIM card in the phone. This will make international travel and juggling work / personal lines for business customers a lot easier. In the UK this functionality is not yet available, but it is likely to be introduced shortly. In conclusion, Apple has successfully made the performance of their iPhone XS and XS Max appealing and accessible to more people in this new iPhone XR. It retains many of the good features at a lower asking price. So, if you want a big-screen iPhone with the best battery life ever then it’s one to seriously consider. Or, if you’re on a budget and not a crazy-tech enthusiast it could be the better buy. However, if you wish to ‘push out the boat’ with Apple’s current flagship then the iPhone XS (or XS Max) will be your phone of choice.